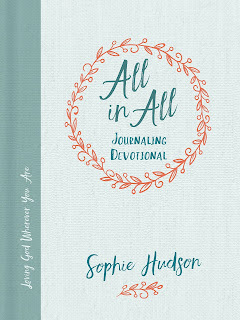 Okay, y'all, if you have not met Sophie Hudson (aka Boo Mama), the writer of A Little Salty to Cut the Sweet, you now have the opportunity to hear her speak wisdom and life through this pretty and stuffed-full-o-truths devotional. As a believer for a long time who has walked through many different seasons, Sophie Hudson's honest words about her experiences intertwined with the Bible have been a balm. There is something that just seems more genuine about someone who is both vulnerable and understands pop culture (Hello Hamilton & Gilmore Girls!) in relation to her walk with Jesus that I just get. With that being said, Hudson's new devotional All in All is being promoted mainly to young ladies in high school and college. And, I get it. Sophie Hudson heart is for teenage/college girls. She works with them in a high school and she fondly recalls life events from her own college years. As someone who also has a heart for teens, this devotional called my name. "Anxiety and stress do not get to boss you around, so don't sacrifice your sanity on the altar of achievement. Put first things first and set aside the other stuff. It can wait. It really can." "Somewhere along the way too many girls have bought into the belief that they have to be the best at everything. But that's a lie. You can absolutely love a life that honors God without being an academic stand-out or an extracurricular all-star [...] No one is handing out prizes for perfect, my friend. Only Jesus earns that prize." Not gonna lie - I am long past high school and college, but I may be taping those truths to my bathroom mirror. I highly recommend this devotional for young women in high school and college, and or if you are an adult like myself with a mind that functions like a teenager most days, you too. * You may order this book from amazon here. This is an affiliate link. Thank you for supporting my blog!